Etsymetal Blog Carnival: Why do you make jewelry? November brings a new topic for Etsymetal team bloggers: Why do you make jewelry? Good question. I certainly did not start out my live thinking I would be a metal artist making jewelry. Even 10 years ago that would have been the farthest away from my mind. I never was much into wearing jewelry, still don't. But somehow when I first started working with precious metals something clicked and I found my happy place. Growing up I always liked design and technical things quite equally. I loved doing things with my own hands. Enjoyed math and physics as much as art classes. So when it came time to choose my calling I thought Architecture would be a good fit. I did love it during college, a bit less once I started working as an architect. I realized over the 15 years working as an architect how frustrating it can be. Lot's of compromises, it's stressful and very challenging. The complexity of it attracted me but it also meant dreams and designs did not usually turn out as expected. I missed being involved in the actual building of the designs beyond just drawing up details and visiting construction sites. Architecture is very complex, involving usually a huge team from designers, managers to engineers and contractors to get one building constructed. There is a lot of separation between design and execution. Somehow in the US the divide is even bigger than in Europe as here legal matters and liability issues are way out of hand. As an architect you just never pick up a tool, you are supposed to leave that to contractors. They usually have the better tool skills than architects but it's still frustrating as I love tools and getting my hands dirty. Plus those multi-million dollar projects I usually worked on took years to get completed. By the time it was done everyone was so frustrated and tired of working together. Usually that does not result in a happy work life. I always had the dream of having my own firm as I never was quite happy working for others. But the more I leaned about the business side of Architecture I realized that I would not have the financial background to sustain the bad payment practices so common in this field, projects dragging out or being cancelled and all the liability issues involved with construction projects. I was quite happy when I realized I might be able to make a living from my new found hobby designing and making jewelery. I stumbled onto metalsmithing by accident. When I was first married (without an engagement or wedding ring) I searched for a ring I liked enough to wear for the rest of my life. I saw some that were close but nothing quite right. In 2005 I found a jewelry class being offered at Santa Monica Community College (SMC) and thought I give it a spin as a means to learn more about the process. It was a great beginners class with lot's of hands on projects. I realized I really liked working with metal and making these tiny little things. Quite a surprise as I never was good at building models during architecture school. Those cardboard, plexy and wood stick buildings usually looked like a huge mess held together by globs of glue. Working with precious metals forces one to be really precise and accurate as not to waste those expensive materials. Plus it's quite nice to be able to just melt those things that did not turn out quite right and start all over until the skill was perfected. It took lot's of practice, trial and error to be able to make jewelry I could be proud of. I took more Saturday classes atLoyola Marymount University which came with 24 hour access to a well equipped studio. Kind of heaven for the tool nerd in me. I had the chance to try out lots of techniques and really find the ones that felt right for me and my design sense. Wax carving and casting emerged as my preferred techiques to get the very 3 dimensional designs realized that where influenced by my architecture background. Rings proved to be my preferred designs which I treated as little 3 dimensional mini sculptures. I loved those hours in the studio, working away quietly, getting dust and metal shavings all over me, my hands being sore and eyes tired after a full productive day. I dreamed about new designs at night and during my work hours in the office, hardly being able to wait until next Saturday to complete them. 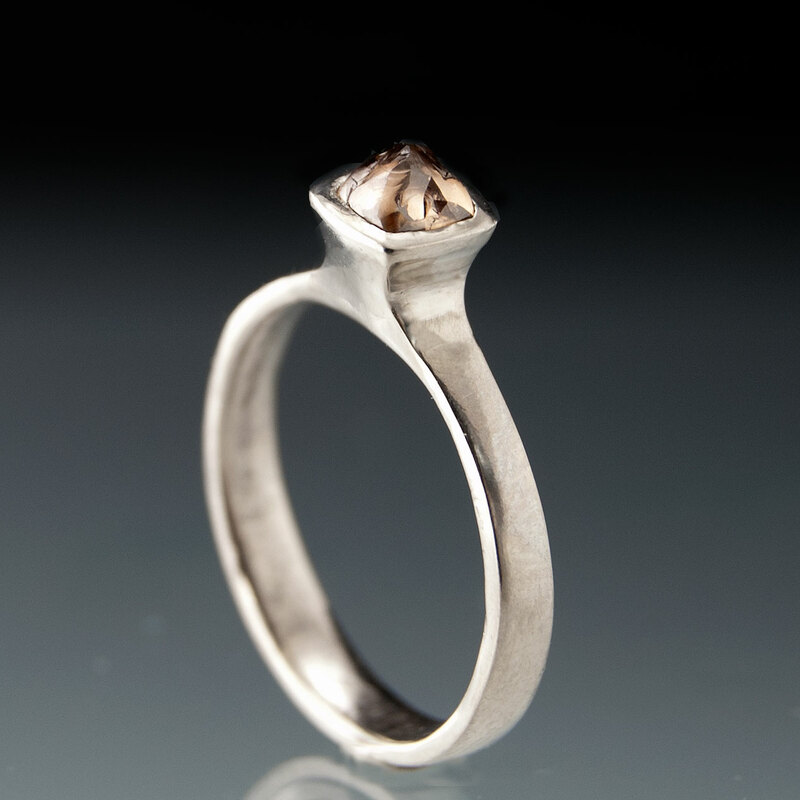 I was fascinated by the science aspect of metalsmithing. There is so much to learn about the physics of metals, chemical and optical aspects of gemstone minerals to be able to understand working with them and highlight them in the best way. It's a perfect marriage of design and science. I love the combination of using ancient techniques and 21st century technology. I finally can indulge in buying tools and using them day in and out. Working on my designs, carving wax, hammering on metal gets me in a happy and very relaxed mood. It helped me even through bad times of my marriage and the divorce as I could forget everything when I was in my studio. I found my true happy place in life. It took a couple years to perfect my skills enough to be able to sell my rings and learning the business site of online retail. Last year I realized I might have a shot at making this my full time adventure. I took a leave of absence for 6 month from my architecture job to give it a try and see if I can make a living with it. I also had to see if I would be bored or unhappy with metalmithing if it became a job and not just a hobby. After the 6 month came to an end things had developed better than expected. I was happy to officially quit my job and call myself self-employed. A year later I still don't miss my architecture job at all. I just love being able to do what I love. There is so much more gratification in this type of work, more freedom to design and create. I am in charge of my own future. I love getting notes from my customers telling me how much the loved the rings I made for them. It's great to be able to do something that has so much meaning for others too and makes the designer and customer happy.